Reading the condolence message personally signed by the governor, the Special Adviser said the late Mr. Omoregbe paid the supreme sacrifice while responding to the government’s charge to community development associations to support its effort to rid the state of kidnappers. Part of the condolence message read, “It is with deep grief that I share your sorrow on the unfortunate death of your father, husband and breadwinner, Mr. Osaze Omoregbe. “At a time our administration is consolidating partnership with our communities and their courageous and committed leaders, your benefactor stood up to be counted. He supported the forces of light seeking to crush the notorious kidnappers who had turned your neighbourhood into a jungle of death. 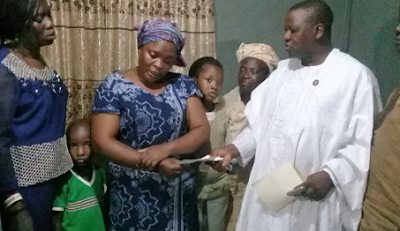 Receiving the cheque, the widow, Omodunni Omoregbe, who was short of words, broke into tears. Speaking on behalf of the LCDA, the chairperson, Jumoke Ademehin-Jumbo, thanked the Lagos State Government for coming to the rescue of the family.